When you spot amazing vegan food online, you just gotta try it, right? Well this is how my ‘relationship’ with The Athenian started – I stumbled across their food whilst scrolling the web and my initial thought was ‘OMG I need to try this’ and it kept popping up all over my feed from then onwards – in Facebook ads, in other blogger’s Instagram stories… and when then also Nick said one day ‘Have you seen this ‘The Athenian’ place yet? Their food looks really nice’ I just knew: I had to go. Coincidence or not – the day after I had made the decision to visit in my head I had an email from them in my inbox. I believe it was a sign that The Athenian and me was just a combination that had to happen. Was it love at first sight? Probably – if that’s something you believe in 😉 Did the love last after getting to know each other better? Heck yeah! On a rainy Saturday last weekend, Nick and me made our way down to The Athenian with some hungry tummies. 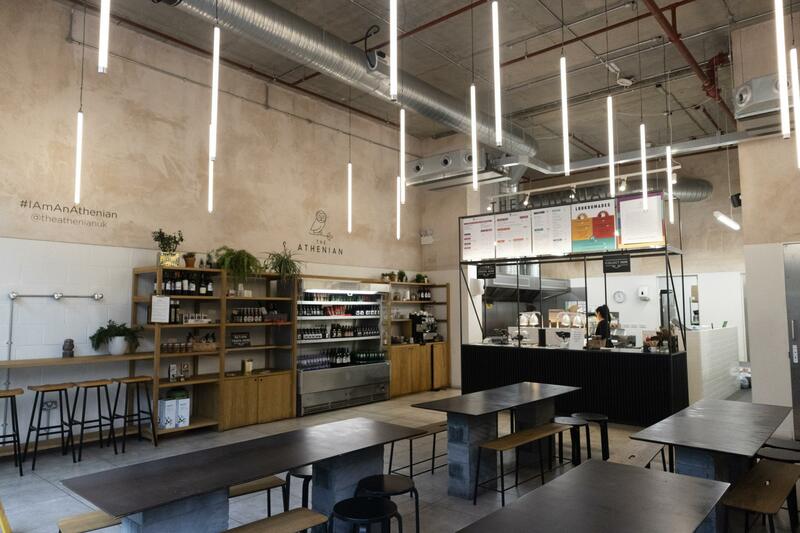 They have a total of 6 branches in London now: White City, Victoria, Tooting, Shoreditch, Elephant & Castle and Southbank Food Market, with the Tooting branch just newly opened. Have a clickety-click here to see the full addresses for these branches. 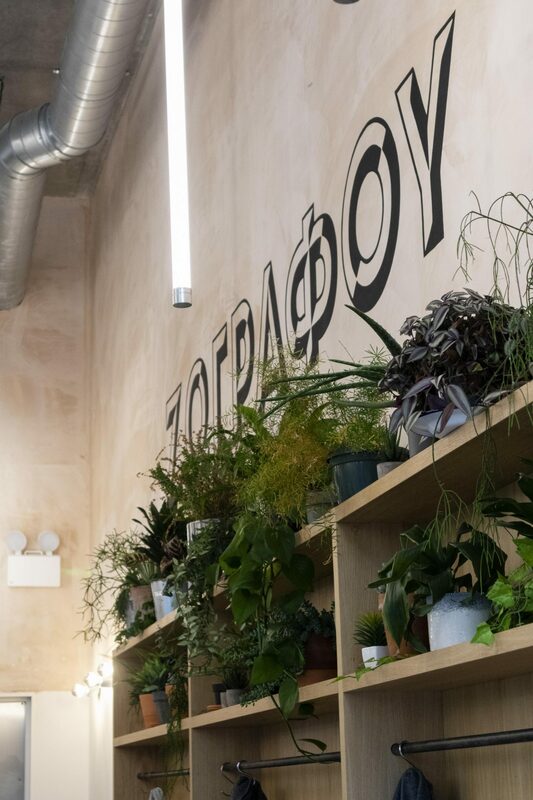 For our very first visit we chose the White City location however, simply as it was the easiest for us to get to (& simply the perfect commute for such a rainy Saturday in London). 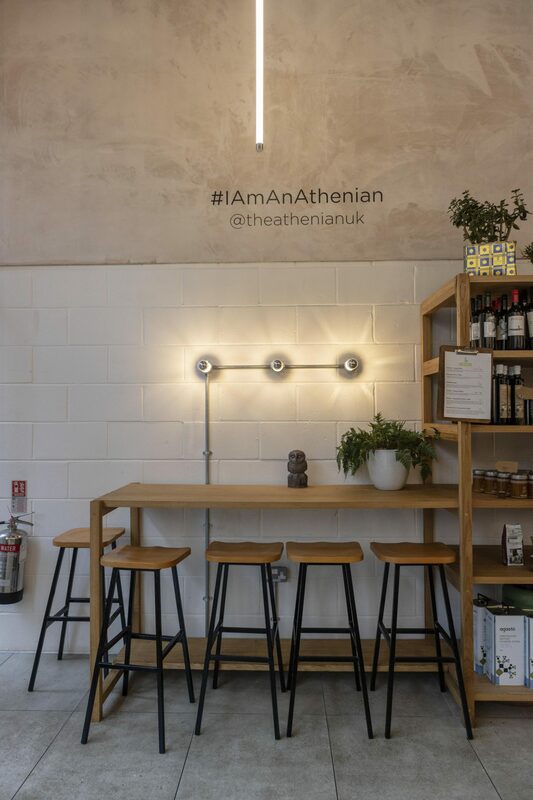 The Athenian also have a restaurant in Bristol, in case that’s closer for you to get the delicious food experience also. The chain has actually opened their doors in the UK around 3 years ago, with the White City branch being roughly 1 year old at the time I’m writing this review. In addition to selling cooked food, they also sells Greek oils, Calamata olives, wine & condiments at the branch. There are however already a bunch of options available that’ll satisfy every vegan craving. 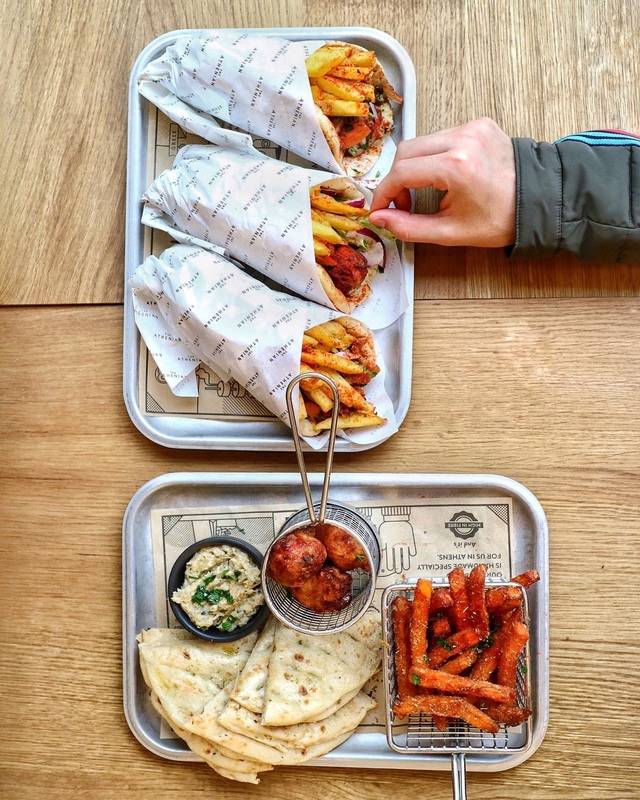 Their Souvlaki offers different combinations of their so called ‘main ingredients’ in either wrap or box alongside a handmade pitta, salad, a dip (Aubergine is the vegan option here) & oregano fries or in ‘naked form’ – without pitta, which makes this option gluten free. 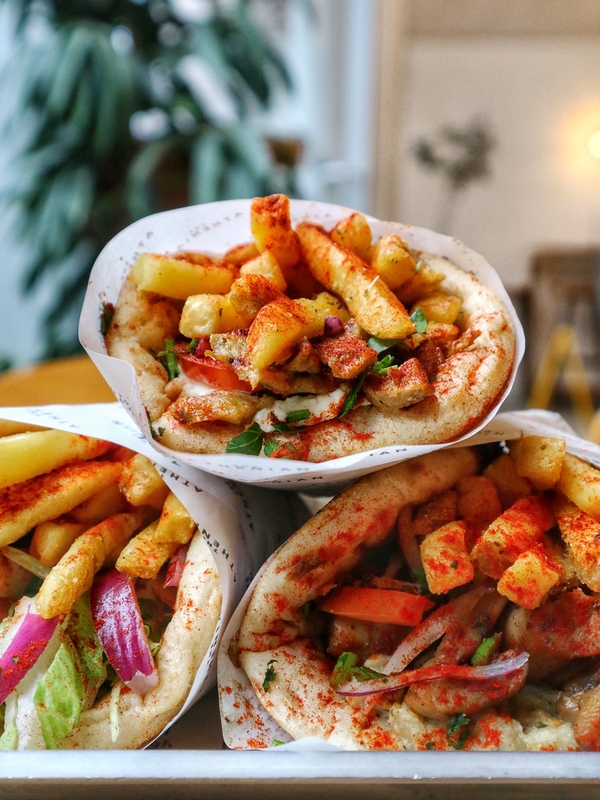 The naked option also comes with a greek salad instead of the pitta, so be aware to replace the greek salad (which contains feta cheese) for the ‘naked’ vegan version! 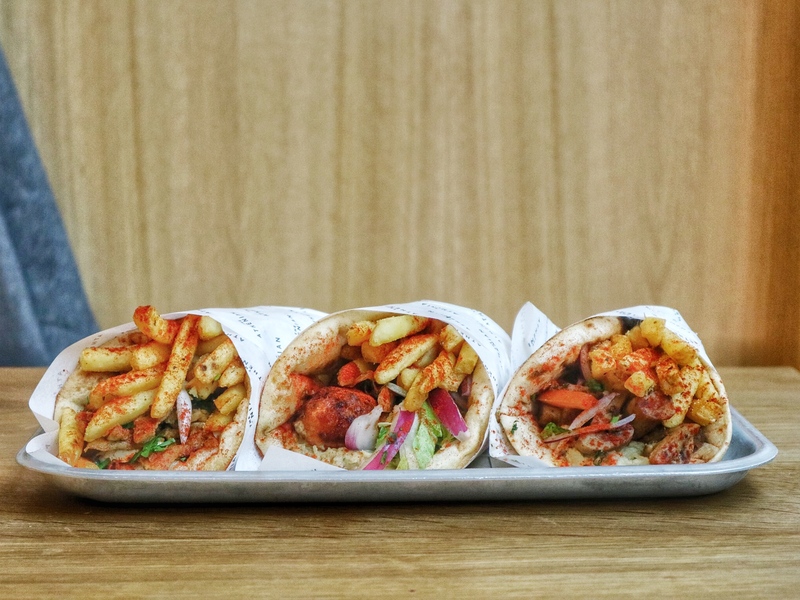 The vegan filling options for the Souvlaki are the Vegan Tomato Croquettes and the Grilled Mushrooms. 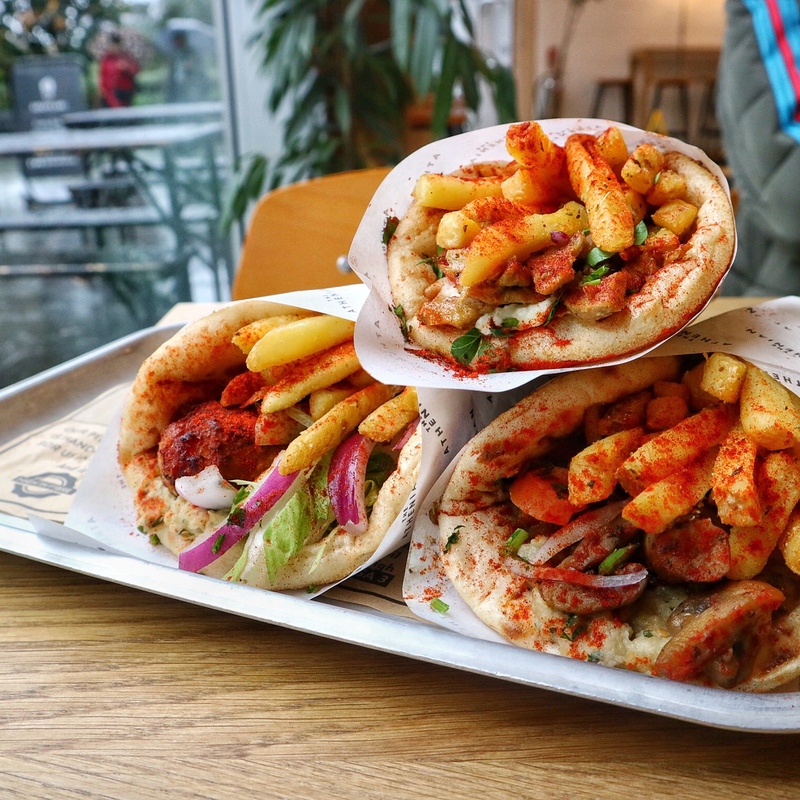 The gyros can be ordered as either a wrap or box and – same as the Souvlaki – comes with salad, a dip and fries. 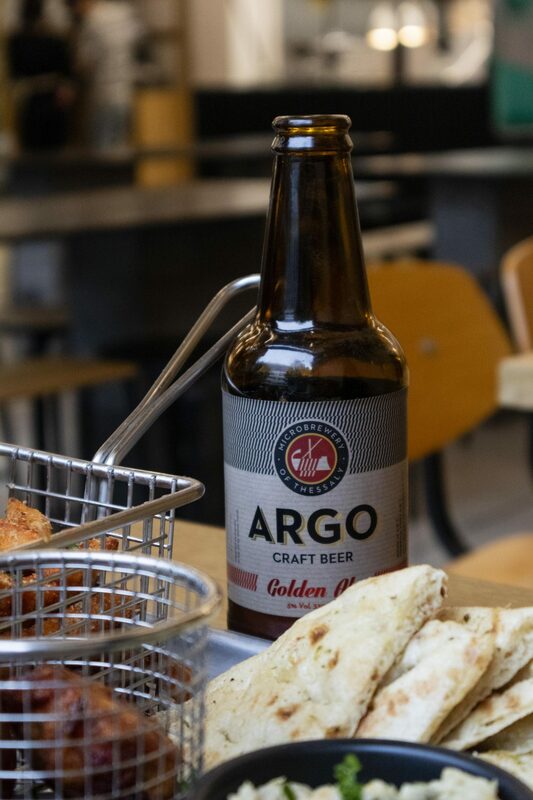 In addition to the food, The Athenian also offer a wide variety of greek soft drinks and beer. 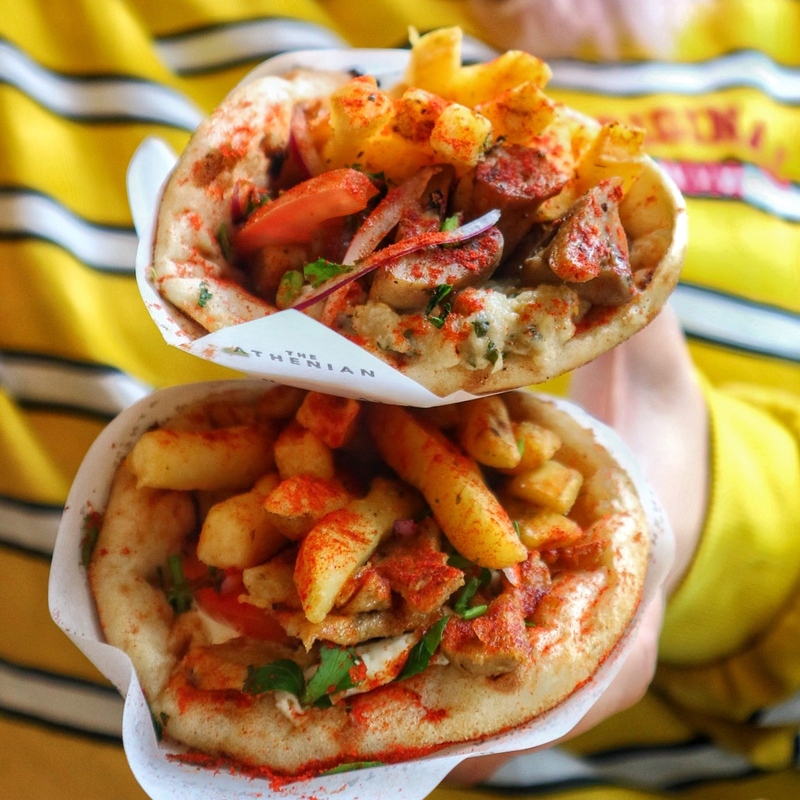 – the Gyros wrap: the marinated Seitan was very well seasoned and it added great texture to the wrap without being too chewy (which can easily happen when Seitan is not well prepared), the vegan mayo was the perfect condiment on the wrap and the oregano fries & smoked paprika powder sprinkled on top just rounded up this wrap perfectly. – The tomato croquettes: Never had anything like it before and I was absolutely wow’d. 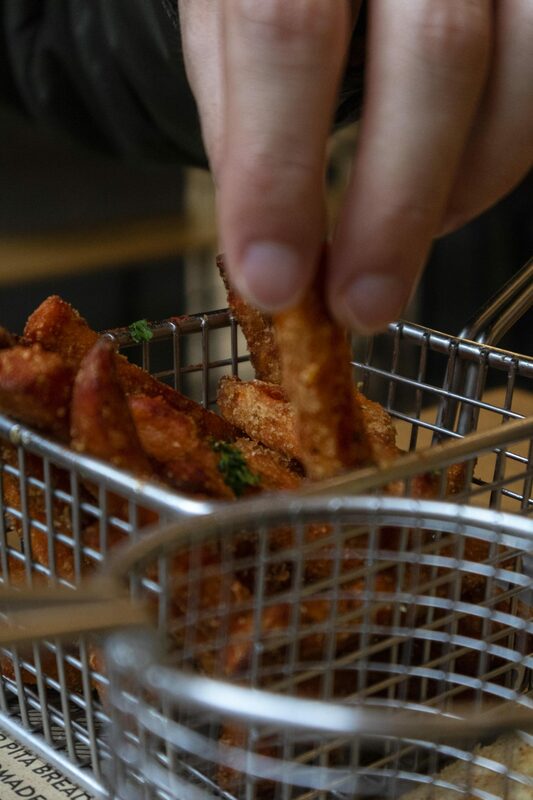 In a nutshell: they are battered and deep fried tomatoes. Super simple, but oh-so-effective on the taste buds. Loved making this tasty discovery and the lovely manager of the branch told us that it’s a traditional recipe from a greek island, where people grow a large variety of different tomatoes – they basically came up with more and more ways to prepare them, and these croquettes are just one tasty version of it. Whilst loving the tomato croquettes on their own, I was a little unsure about them in the souvlaki, mainly because of the combination with the aubergine dip. As I also had the pitta (which was super fluffy and purely delicious!) 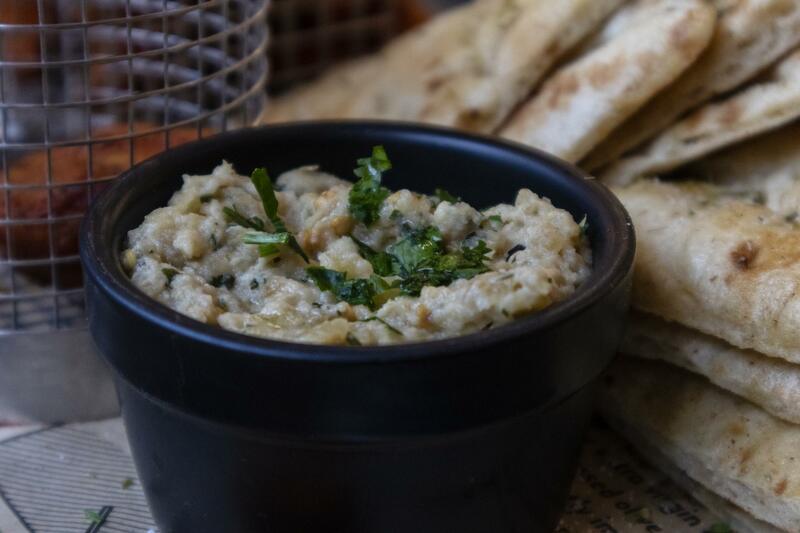 on the side with aubergine dip, I realised that I was not very fond of the smoked aubergine dip and simply didn’t enjoy the combination with the croquettes on the souvlaki. I think it was simply down to personal preference and just a flavour I wasn’t to familiar with. Oddly enough I think it really worked with the Grilled Mushrooms though! 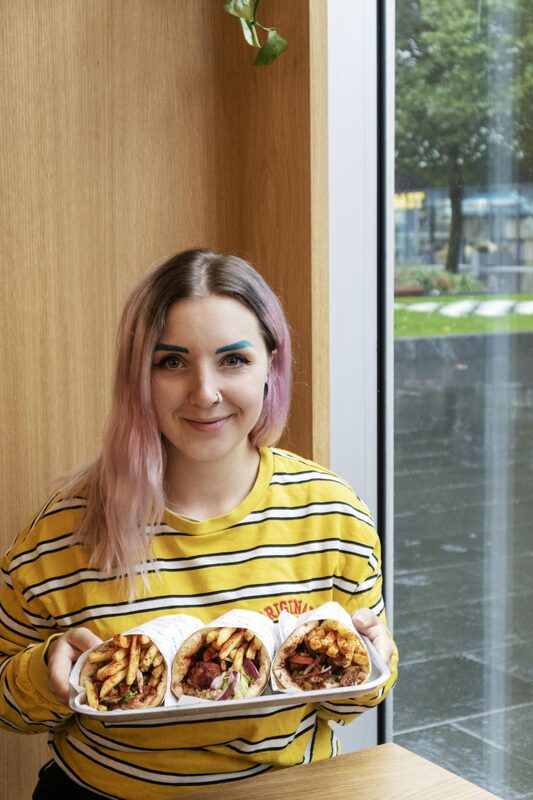 The wraps were super-filling, especially with the fries added to them – each wraps is definitely a filling lunch option on its own, so I wasn’t surprised to hear that the branch has huge lines out the door during weekday lunch times. 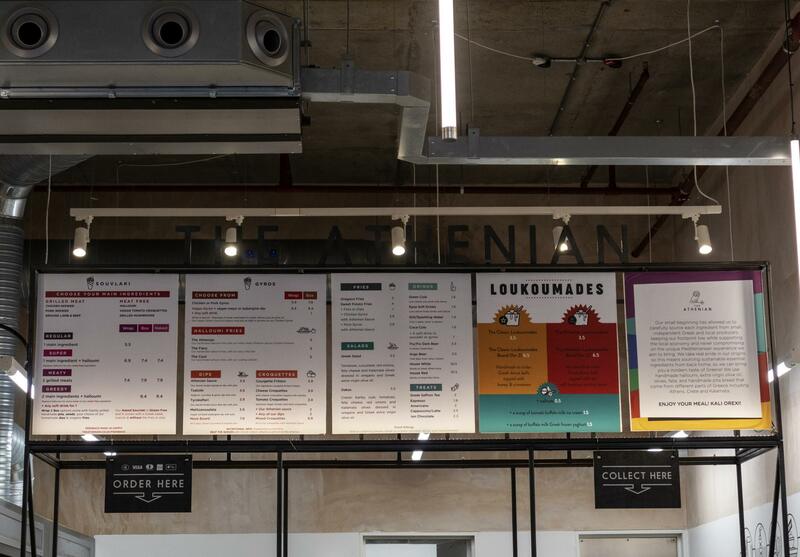 Find out more about The Athenian on their website.